Average Weight	: 9 - 15 lbs. The Tibetan Spaniel is considered an ancient breed, being that there is evidence of its existence over 2000 years ago. **Most small Asian dogs are believed to be descended from the Tibbie. The Tibetan Spaniel started out as small monastery dogs in Tibet, China. It is descended from dogs from China and other Buddhist countries. They were once known as the "little Lions" and were so highly regarded that they were given as gifts to the royal palaces of China. The breed is likely to have common ancestors with a number of the Oriental breeds, including the Japanese Chin and the Pekingese. The monks of Tibet sometimes used the Tibetan Spaniels as watchdogs, as the animals would bark with the approach of strangers to the monasteries. Because of their dispositions the animals were much loved and revered. The early Tibetan Spaniels sat on the high walls of the monasteries and this love of heights has not been lost through the ages. By the 1890's the Tibetan Spaniels were being bred in the United Kingdom. It was not until 1965 that the first authenticated reference to Tibetan Spaniels in the United States is found. This was a litter born out of two imported dogs from a Tibetan monastery. It is descended from dogs from China and other Buddhist countries. The Tibetan Spaniel is considered an ancient breed, being that there is evidence of its existence over 2000 years ago. Most small Asian dogs are believed to be descended from the Tibbie. Highly esteemed in ancient Tibet, they were often given as gifts to royal houses and the dogs were spread throughout Asia. Depictions of the dogs were found on early Eastern art dating back as far as 1100 BC. The dogs worked turning the prayer wheel for their masters and also as watchdogs in Tibetan monasteries. They would sit up on the high walls and bark at anything they believed didn't belong. The breed was first introduced to England in the late 1800s. The Tibetan Spaniel is often mistaken for the Pekingese, the differences being that the Tibetan Spaniel has a less profuse coat, slightly longer face and does not have the extra skin around the eyes. The Tibetan Spaniel is a happy and very intelligent breed. The animal will bond with family members and other pets that may be in the home as long as the introduction is started early in its life. The breed is often considered assertive and can be somewhat aloof with strangers who enter the home. This aloofness will fade as the animal begins to know and trust the new arrival to the home. It is not uncommon for a Tibetan Spaniel to become a bit jealous if a new baby is brought into the home. This, too, will fade as time goes by and the pet realizes that it is still a member of the family. Tibetan Spaniels make fine house pets especially for the elderly and those families that may have small children. Tibbies, as they are often called, love to be held and make good lap dogs. They enjoy attention and love to be involved with the family or single owner. It should be noted, however, that they do have an independent spirit and they can be very willful at times. This can make them a bit hard to train in the usual sense of the word. Most Tibetan Spaniels will bark to announce the arrival of strangers. They can make good watchdogs, but they do not bark excessively or without cause. Likewise, they not enjoy loud, sudden noise and may become skittish if this happens too often. When treated properly they can become very affectionate toward their owners. They can also become very devoted and loyal. For the most part, they do not like being surprised or suddenly grabbed. The Tibetan Spaniels are very sensitive animals will often understand and respond to your moods and feelings. While Tibbies are not guard dogs and should never show signs of aggression or bite, they do, as mentioned above, make fairly good watchdogs and will alert you to any unusual event or arrival. They do this by barking and this is one of their historical attributes. When they are healthy and feel good, they are neither nervous nor hyper but rather have a calm attitude and personality. This calm personality is one of the benefits that they have for elderly owners who may not be able to run after them or look in on them as they would have to do with more nervous types of animals. Owners should be aware that they love any high lookout such as a window sill. Because of their calm and affectionate nature they enjoy being close to humans and will happily go to bed with you or sit next to you. Tibetan Spaniels have very good hearing, keen sight, and good scenting powers. They are very long lived and are not given to early aging or much illness. Grooming for a Tibetan Spaniel is easy, and is, in fact, one of the easiest breeds to keep groomed. The breed is considered an average shedder but once a year it will shed in clumps. This is normal and should not cause alarm. During its shedding season the owner should brush the animal as usual. During the non-shedding season it is fine to brush the animal once a week. The coat is fairly easy to take care of and a regular brushing should suffice. They are a completely natural breed and require no plucking, stripping, or clipping of the coat. The teeth need to be kept clean as well. If the owner is not able to perform this grooming task, a pet salon should be used. Proper dental care is extremely important as it helps your pet to keep its teeth for as long as possible. Special care should be taken when cleaning your pet's ears. For general cleaning, you can use baby oil and a cotton ball. Take special care to not go too far into the ear as you could damage the ear drum. It is best to gently wipe around the outer ear and remove any debris that you may find. You should also trim your pet's nails once a week or so to prevent overgrowth. This is very easy to do. You will need a pair of animal nail clippers that can be found in most pet stores. Only trim the top portion of the nail and do not over cut into the nail. New dog owners can take a class on how to properly perform these tasks at most pet grooming salons. The tools and brushes needed for grooming the Tibetan Spaniel are readily available and affordable at most pet stores. 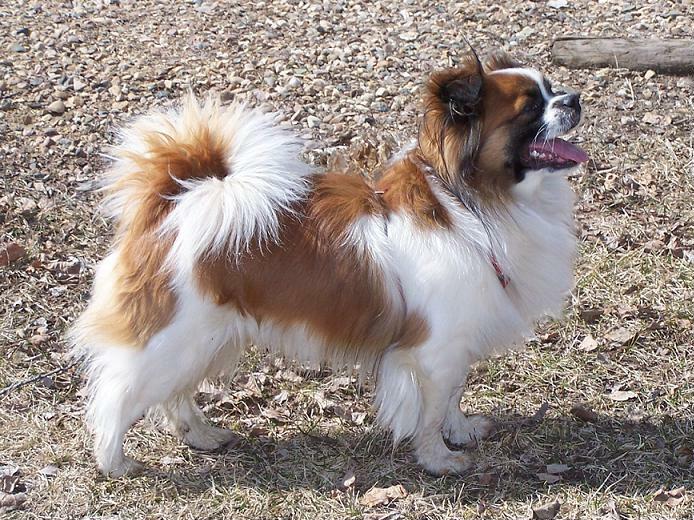 While the Tibetan Spaniel is a small breed it can be energetic. In addition to the usual playfulness it will exhibit while indoors, it also loves to be taken on walks. The breed will gladly play with children in the backyard and it loves to run and be happy while out of doors. When walking or playing with your Tibetan Spaniel outside you should be aware of larger animals that may be in the area. The Tibetan Spaniel does not have good self-protection skills or means of protecting itself from more aggressive animals. For exercise purposes, it is considered a Medium Level breed. It will enjoy hearty workouts but they should not be overly taxing to the animal. In general, a healthy animal will enjoy about 20 to 40 minutes of fun exercise before it tires out or loses interest. General obedience training is highly recommended for this breed and should begin at an early age. The Tibetan Spaniel, because of its rather willful nature, is not known as one of the more trainable breeds. This does not mean that they are bad dogs, but they are hard to train and often owners become frustrated over the lack of progress. They are, however, very good house pets and can be house trained with ease. Because they are not overly aggressive they do not especially need training for this as some larger dogs do. The Tibetan Spaniel rarely, if ever, bites. They are, by nature, playful and friendly, although they do tend to be stand offish with strangers to the home. It is entirely possible to train the breed to do simple tasks such as sit. But the more entertaining tricks might pose a challenge to the owner. There are some books especially written for this breed that may be of use to the training owner, but, again, do not get your hopes up too high. General obedience classes can be used to help the animal retain some of the basics of good manners. These classes are often taught by trained professionals who know the breed and how to interact with them for better results. Many of these classes take a week or less to complete. Many owners simply decide that the breed is what it is and that is one of its endearing charms.